A parliamentary report of 1777 recorded local workhouses in operation at Rothbury (for up to 22 inmates) and Whitton (22 inmates). The Rothbury Poor Law Union formally came into existence on 8th October 1836. Its operation was overseen by an elected Board of Guardians, representing its 71 constituent parishes and townshipsWhitton (22), as listed below. Each parish was represented by one Guardian, except Rothbury itself which had two. Parish of Rothbury: Rothbury, Bickerton, Caistron, Cartington, Debton, Fallowlees, Hotterton, Hepple, Hepple Demesne, Hesleyhurst, Hollinghill, Lee Ward, Mount Healey, Newtown, Pauperhaugh, Raw, Snitter, Thropton, Great Tosson and Ryehill, Little Tosson, High and Low Trewhitt, Warton, Whitton, Wreighill. Parish of Alnham: Alnham, Prendwick, Screnwood, Unthank. Parish of Alwinton: Alwinton, Biddlestone, Burradon, Clonnel, Fairhaugh, Farnham, Linbridge, Netherton (North Side), Netherton (South Side), Peels, Sharpeton. Chapelry of Brinkburn: Brinkburn (High Ward), Brinkburn (Low Ward), Brinkburn (South Side). Parish of Hartburn: Fairnley, Greenleighton, Hartington, Hartington Hall, Harwood, Rothley, Holystone, Barrow, Dueshill, Harbottle, Linshules, Kidland. Chapelry of Netherwitton: Coatyards, Ewersley, Healey & Combhill, Nunny Kirk, Ritton Colt Park, Ritton White House. Parish of Whittingham: Callaley and Yetlington, Lorbottle, Great Ryle, Little Ryle, Whittingham. The population falling within the union at the 1831 census had been 7,715 — ranging from Fairhaugh (population 4) to Rothbury itself (1,014). The average annual poor-rate expenditure for the period 1834-6 had been £3,689. 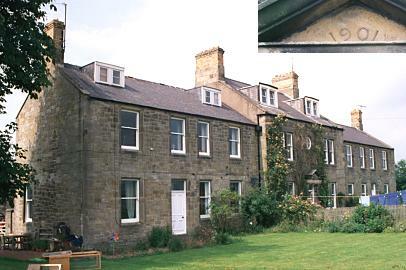 Prior to 1902, Rothbury's union workhouse was a building situated on Town Foot at the east of Rothbury — presumably the former Rothbury parish workhouse. Its location is shown on the 1897 map below. Rothbury's first workhouse site, 1897. Rothbury Town Foot workhouse site from the south, c.1906. The former Town Foot workhouse still exists and the building has now been converted to residential use. 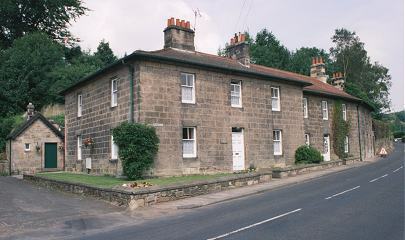 Rothbury's Town Foot Union workhouse site from the south-west, 2001. On 20th September 1901 the Rothbury Board of Guardians purchased a site for a new workhouse on Silverton Lane to the south of the town. The conveyance named the sellers of the land as 'the Most Noble Henry George Percy, Duke of Northumberland and the Honourable Henry Algernon George Percy'. By the following year, a new workhouse and school had been erected. In 1905, the Rothbury Board of Guardians invited tenders for a water supply to the building. The new workhouse could accommodate 50 inmates. The main building at the centre of the site was two-storey block with the master and matron's accommodation at the centre, men's day room and dormitories to the east, and women's to the west. To the rear was a single-storey service block containing a wash-house, laundry, kitchen, shed, and mortuary. There was a large separate annexe to the south — possibly a casual ward for vagrants. The site layout can be seen on the 1920 OS map, by which time the workhouse had become officially known as Rothbury Poor Law Institution. Rothbury later workhouse site, 1920. Rothbury entrance and former casual ward(?) from the west, 2001. 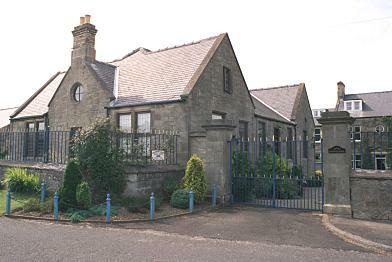 Rothbury main building from the south, 2001. Rothbury from the south-west, 2001. 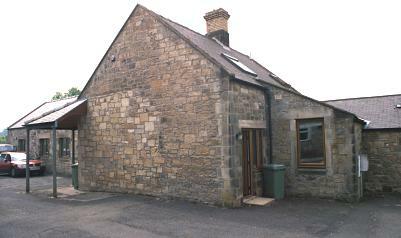 Rothbury service block from the north-east, 2001. In around 1932, a separate single-storey timber-built school-room was added to the west of the main workhouse. By 1941, the establishment had been renamed Silverton House and was a home for forty-five young mental defectives, including fourteen epileptics. The patients' education was provided by the chief male nurse, together with one of the older girl patients, and activities included a percussion band. Advice from Board of Control inspectors was that teaching should concentrate on practical skills such as doing up buttons and shoelaces rather reading or writing. 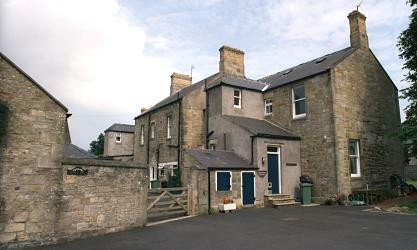 The former workhouse buildings have now been converted into residential accommodation. The annexe to the south is now called Silverton Lodge, and according to the present owners has had a number of functions over the years, including use as a school. The site was apparently occupied by the army during the war, and also used as a golf course. The building was derelict from the 1960s until 1988. Northumberland Archives, Woodhorn, Queen Elizabeth II Country Park, Ashington, Northumberland NE63 9YF. Virtually no local records survive. A History of Northumberland County Council 1889-1989 by Joan M Taylor.